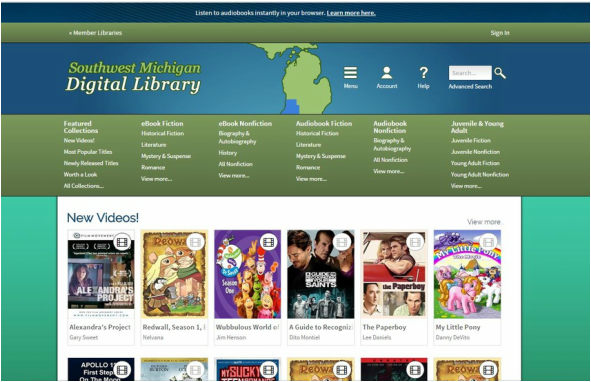 Download books, audiobooks, and videos directly to your eReader or electronic device using OverDrive's Southwest Michigan Digital Library. All you need is your library card! To get started, simply ask a librarian to add your library card number to the OverDrive system. Then you can log in to OverDrive and begin downloading materials and placing holds! Look at the lists below for instructions specific to your device and information about what OverDrive has to offer the patrons of Lawton Public Library. If you have any questions, please do not hesitate to ask a librarian! Search for books by title and author or browse by genres and collection, such as most popular titles and new releases. Large selections of both fiction and nonfiction books are available for children, teens and adults. Download movies and television shows directly to your device! Choose from a large selection of videos for both adults and children. Audiobooks for all ages are offered on OverDrive. Listen to historical fiction, novels, biographies, science fiction, romance, children's books and many more! Click Here to Learn About Libby, OverDrive's New App!